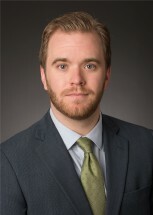 Brendan M. McNeal joined Edgar Law Firm as an associate attorney in 2018. Currently, he focuses his practice on commercial and class action litigation matters across the country. Before joining the firm, Brendan served as a law clerk to Hon. Michael B. Buser of the Kansas Court of Appeals. During law school, Brendan was a note and comment editor for the University of Kansas Law Review and also a member of the Moot Court Council. A native of Boulder, Colorado, Brendan now resides in Kansas City, Missouri. He enjoys hiking, TCU athletics, and volunteering at the National World War I Museum and Memorial.